WASHINGTON, DC, December 20, 2010 (ENS) – On the night of December 20 to 21, a total lunar eclipse will be visible to sky watchers across North America and Central America, Greenland and Iceland, western Europe and western Asia. 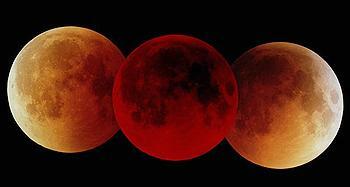 It is the first time a lunar eclipse and winter solstice have occurred on the same day in 372 years. While it is a coincidence that the eclipse falls on the same date as the shortest day of the year – the winter solstice – for eclipse watchers this means that the Moon will appear very high in the night sky, as the solstice marks the time when the Earth’s axial tilt is farthest away from the Sun. From beginning to end, the eclipse will last about three hours and 28 minutes. North America and Central America will have the best view of the lunar eclipse, which will begin at 06:33 UTC. The stage of total eclipse will last for 72 minutes beginning at 07:41 UTC. For observers on the east coast of the United States, the eclipse lasts from 1:33 am EST through 5:01 am EST. For viewers on the west coast of the United States the eclipse begins at 10:33 pm PST on December 20 and lasts until 2:01 am PST on December 21. Viewers in western Europe will be able to see the beginning stages of the eclipse before moonset, and in western Asia the later stages of the eclipse will be visible after moonrise. A lunar eclipse occurs when the Earth lines up directly between the Sun and the Moon, blocking the Sun’s rays and casting a shadow on the Moon. As the Moon moves deeper and deeper into the Earth’s shadow, the Moon changes color, turning from gray to an orange or deep shade of red. The Moon takes on this new color because indirect sunlight is still able to pass through Earth’s atmosphere and cast a glow on the Moon. The atmosphere filters out most of the blue colored light, leaving the red and orange hues that we see during a lunar eclipse. Extra particles in the atmosphere, perhaps from a recent volcanic eruption, will cause the Moon to appear a darker shade of red. NASA has planned several activities to help the public enjoy the total lunar eclipse. Astronomers at NASA’s Marshall Space Flight Center in Huntsville, Alabama, will host a pair of live web chats to answer questions and help make the rare celestial experience one to remember. Marshall Center astronomer Rob Suggs will hold the first chat from 3 to 4 pm EST today and discuss the best ways to view the eclipse. In Germany, the University of Applied Sciences Offenburg will cover the lunar eclipse live on December, 21 from 7:15 am CET. Their scientsts will provide information about the eclipse and live pictures from different places of the Earth until around 12 am. The university will produce live in HD-quality for the first time, so that sharp pictures will be available.